Tennessee Facts | Cool Kid Facts . Tennessee is a landlocked southern state known for its role in country and rock ‘n roll history, as well as its astonishing natural beauty, including the Great Smoky Mountains. The state is also home to historic Civil War battlefields and memorials, a variety of historical and cultural museums, and even a life-size replica of Greece’s Parthenon. Lowest point: Mississippi River at 178 ft. 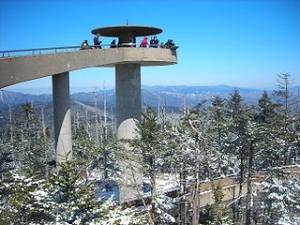 Highest point: Clingmans Dome at 6,643 ft. The most visited national park in the United States is the Great Smoky Mountains National Park in Tennessee. In fact, it attracts twice as many visitors each year as the second most-visited national park, the Grand Canyon. The Bonnaroo music festival in Manchester, Tennessee takes place on over 500 acres of farmland. It’s one of the largest music festivals in the world. Tennessee ties with Missouri as the “most neighborly” state in the nation. It borders eight other states: Kentucky, Virginia, North Carolina, Georgia, Alabama, Mississippi, Arkansas, and Missouri. Elvis Presley’s home, Graceland, is located in Memphis, Tennessee. It’s the second most visited home in the country, just behind the White House in Washington D.C.
Tennessee has replicas of at least two famous buildings: the Parthenon and the Eiffel Tower. A life-size replica of the ancient Greek Parthenon stands in Nashville’s Centennial Park. And in Paris, Tennessee, there’s a seven-story replica of the Eiffel Tower located in Paris, France. The Lost Sea in Sweetwater, Tennessee is a huge cave system featuring the largest underground lake in the United States. Over 13 acres of water have been discovered so far.